Last year I recall a friend spent over $500 USD and never received a Type-59. This year I've seen a post of over 500 purchased boxes and not a single IS-3a. These boxes are yet again an excellent gold value. If you want to put gold or premium time in your account then I would recommend purchasing loot boxes. DO NOT BUY boxes with the intent of finding a specific tank. Even with a high percent chance, there is never a guarantee. Before you click buy make sure you answer this question: If I don't get the tank I want am I still going to be happy with this purchase? If yes, then boxes are the most monetarily efficient way to populate your account with gold. A note on data: I want to thank everybody that has submitted data to me. I only kept data that I could verify as accurate through screenshots or video recordings. Because of this I've sacrificed quantity for quality. You can find the raw data for this article here. ​Data will be updated as I collect more through out the coming weeks. Below is the raw gold, credits, garage slots, and premium tanks mined from the data I have. However, not all loot box packages are the same value. This table determines the gold value of each package based on 878 gold / box. * For the sake of this calculation I rounded up each cost by 1 cent. If we consider the frequent war chest bundle of 25,000 gold for $100 USD which yields 250 gold per $1 USD, then it becomes obvious the actual value of these bundles. These values mirror the value from last year's loot boxes. The new 3D skins for the IS-7, BC 25t, T57 Heavy, and Grille are also available from loot boxes. Since once you pull all 4, you are unable to pull duplicates the only way to calculate their drop rates is to only take into account all boxes until the 4th skin is drawn. This means in my data set the odds of pulling 1 of the 4 skins is roughly 5.64% - keep in mind this will vary wildly as, I have low confidence in the accuracy of this drop considering the small data set. Worth noting during this event there is a chance to draw Simon Claws. 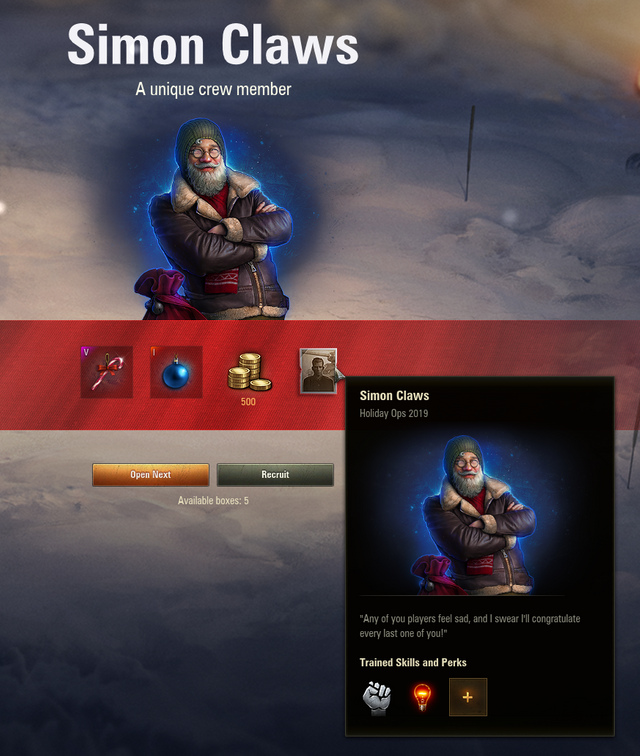 Simon Claws comes with a 0-skill BiA and a 0-Skill Sixth Sense, along with a fully trained 3rd skill. This makes him the best tank commander, and the best crew member in the game. This crewman will train twice as quickly as a regular 0-Skill crew member and three times faster than a regular crew member. Similar to the 3D skins, you can only draw him once making it difficult to actually pinpoint the odds. In my data sets pulling Simon Claws is roughly 2.12% - keep in mind this will also vary wildly, and I consider this statistic to also be of low confidence. I didn't do drop rates last year as I didn't feel I had a large enough data set to make accurate data. I've decided to post my drop rates, but keep in mind my data set is small and the actual drop rates my vary by a wide margin. There is another MUCH larger data set available here. However this data set was compiled by any tanker entering in their own values, and is possibly subject to inaccuracies. Use my values (low quantity) or the values from user submitted data at your own risk. It has been hypothesized that the game will determine the tier of drop - and then fulfill it with a random vehicle you are missing. Once you own all the vehicles of that tier, then when that tier is pulled again you will get a random drop of any available tank. In this way - the drop rates of each specific tank may differ greatly. This hypothesis was accurate for my pull of 150 boxes. Since this may be accurate I've decided to post drop rates by tier. If you believe this information to be false I've still published the rates by tank as well. It has also been hypothesized that the drop rates are lowered after the first few days of sales. I have also found this to be false in my data.